3 What is different from other methods of dyeing? 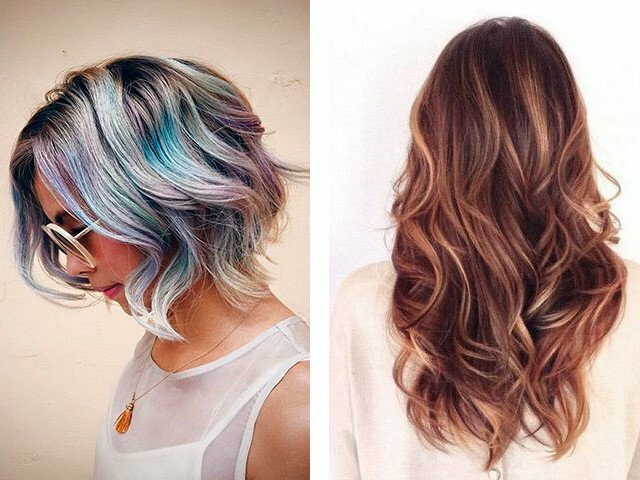 If a woman wants to change the image and give it originality, you can try hair coloring. This is a trendy way to staining, which allows to combine several colors. Selection of colors is carried out depending on the color of eyes, skin, face shape. With coloring woman can demonstrate to others the nature of. The procedure can be done in a salon or at home. Hair coloring – dyeing techniques. Its essence is to give the individual strands of different shades. Usually they are as close to natural color. During dyeing effects is only a portion of the hair. Coloring allows you to focus on individual parts of the hairstyles. Using the method of shine and natural volume. The method allows to achieve the most natural effect. Proper execution of the hair coloring to highlight features hairstyles. So, if a woman has done a haircut ladder, experts recommend to lighten the hair closer to the end. This will make them as vivid and iridescent in the sun. During the coloring can be used by 2 to 15 paint colors. Sometimes it is possible to exceed the indicator. If you use only 1, staining call highlights. If a woman wants to create a standard official image, Use shades of the same color. Lover epatazha experiments and suitable application of bright contrasting colors. Hair coloring has appeared in the list of beauty parlors recently. It can run on a brown and black hair. If sparing paint applied, locks are not damaged. The method can be applied on the strands of any length. multicolour. Suitable for women, regardless of age. During the procedure, use two or more colors. Inside varieties stood out youth trend. The standard is characterized by an asymmetric application of dyes. Acquires eccentricity. Status women or adherents of the classical type of dye used natural shades. they are usually lighter than the natural color of hair on 2-4 t. Staining must be performed with the use of professional tools. This would lead to saturation and resistance. hombre. The transition from the roots to the tips carried out smoothly. Tone gradually changes from one color to another. Selection of colors is carried out individually. It depends on the original color. Formation Ombre is from large or small pieces. In the latter case, their size is 1-2 mm. American. It involves the use 3-5 shades of red. The technology is a sophisticated staining. Impact turns into thin strands. Between tones smooth transition. Style suits the owners of dark hair and brown. Balayaj. It is recommended to use thin curls owners. sophisticated technology. The paint is applied dabs. Exposures are only certain parts of the strands. During the procedure, the wizard uses 3-4 t. They are as close to the natural color curls. The procedure allows for natural dyeing effect. The method makes high demands on the professionalism wizard. Creative. It involves the use of unnatural colors. Apply only saturated colors. The application of paint is made on thick strands. They excel in several areas of hair. Sometimes the paint is applied only to the tips. Neonovaya. Faded colors are not used. Master uses bright, unnatural colors. Usually, their selection is carried out in a tone of clothes, Nail or accessories. Possible to use the stencil. vertical. It involves the use 3-18 shades. Staining is performed zonally. Their size determines the master. The process is performed in the vertical. After that, the staining in the selected color. The strands are painted separately. Contrasting color transitions. Hairstyle given asymmetry. horizontal. Sometimes it is called a transverse. It involves the use of no more than 3 shades. Hair is made horizontal Separation. Allocate the bottom part, middle part and closer to the roots. Each of them, in turn, is divided into small clumps. Dark shade is placed on top of. The lightest tone is applied to the lower part. In this case, the middle acts as a transition zone. Salt and pepper. Usually applied to light brown hair streaked with gray. The upper strand lighter. Next, the staining in bright colors. It runs down a gradual transition. Here the artist uses dark colors. Zonalnaya. Staining is performed on a specific area. patterned. Hair color also changes the zonal. When the stencil assistance to the selected portion of the curl is applied geometrical pattern. For him, used bright contrasting colors. coloring bangs. Coloration undergoes a strand of hair over the forehead. The rest is not exposed to the effects of hairstyle. What is different from other methods of dyeing? Coloring on dark hair is different from dyeing. The latter method involves the clarification of individual strands. Hair coloring can emphasize the characteristics of hairstyles. Highlighting uses only one color. Coloring involves the use of two or more colors. The procedure is more expensive, than highlighting or conventional staining. The price depends on the number of colors, tress, makeup, which will use the wizard, prestige salon and hairdresser. If you are coloring hair, photo will evaluate the final result. The procedure is complete and partial. In the second situation staining exposed only a few strands. The hairstyle is dominated by the natural color. Hair, subjected to staining, can harmoniously integrate into his or contrast. Selection of paint colors is made individually. This is done, to the final result looked impressive. Coloring hair coloring technique involves the use of various types of dyes. Execution time depends on the original color, Selected inks and the desired effect. After the procedure, the natural color comes alive. He begins to sparkle and play different shades. The volume of fine hair visually increases. Haircut starts to seem more magnificent. Light affects the appearance of hair styles. Its hue is able to change. It depends on the color sequence, Use wizard. Even simple hairstyle look original and fashionable. The method allows to disguise gray hair. As a result, the woman begins to look younger. The image of the whole refreshed. Hair coloring can be done, if a woman is the owner of the complex haircut. The method will allow to place correctly bright accents, giving the image of style, originality and individuality. Hair coloring gives the appearance of a woman of elegance, appeal and glamor. Staining recommended personalities, preferring imaginative and creative hairstyles without undue outrageous and vulgar. Coloring on short hair is suitable for women, regardless of age. Procedures allow the curls to make the color deeper and multifaceted, add the brightness and contrast. The method is recommended to owners of fine hair. By the process will be able to create an additional volume. The method is suitable, and the owners of a graded haircut. Hair coloring emphasize their. The method is performed on the light and dark curls. Coloring hair is not for everyone. Abandon the procedure recommended in the presence of damaged and unhealthy curls. Staining of the positive effect will not give. It may on the contrary to emphasize the shortcomings. The procedure is recommended to give up after a perm and coloring Henna. The method is not recommended during pregnancy. Fashionable Hair coloring is usually performed at the fair, and dark brown curls. In the latter two cases, perform the procedure more complicated. In addition, to be implemented discoloration. On the red hair coloring is rarely fulfilled. This hairstyle is already attracting worldwide attention. If a woman with red hair will make a decision to change the color using the method, strands slightly lighten or painted in chocolate and coffee tones. Application of colors produced in series. They move from one to another. Coloring on long hair technician to complete easier. The procedure may be carried out using whole list staining techniques. 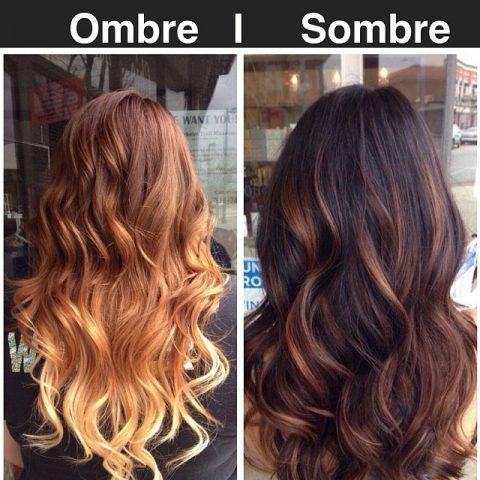 Winning will look Ombre, sombre or Sambre. In the first case, the wizard creates a border transition from one shade to another. it is smooth. In the second situation is made staining separate curls. Use natural shades. In addition, a gradient is created. The process is performed with a space from the root zone. If you are chambray, staining exposed thin strands. At the same colors are not bright. The wizard creates a gradient. Advantageously looked blondirovanie. In this case, the individual hair coloring exposed. The wizard uses dark or light shades. If you are balayazh, exposures are only tips. As a result, it manages to achieve the effect of burnt strands. It is located in trends. Mazhimesh involves lightening locks. However, it is barely noticeable. If made of hair coloring, exposures are broad curls. The gradient is also created. he is smooth. Micro-blondirovanie involves staining of thin strands. Impact across the entire width. Tone selected depending on the shade base. It is characterized by one tone. Coloring on short hair can also be done using a large number of techniques. They are different from those, that is used in a color staining on long hair. So, holders of short hair coloring suitable cross. In this case, the master selects two contrasting shades. Between them is formed a clear boundary. Staining is performed horizontally. If performed zonal hair coloring, painted only part of curls. So, the procedure may involve only a bang. Unusual way is considered avant-garde coloring. In the bright colors used his time. They differ from the basic tone. Multicolored coloring strands involves staining in different colors. They differ from the basic tone. A woman can fulfill their partial and horizontal painting. In this case, the strands are exposed along the entire length. Use a contrasting color. Holders of a short haircut may perform stencil painting. Using the method creates a pattern on the hair. Master uses a special stencil. Coloring on medium hair is also performed. Holders of hairstyles were more fortunate. They can choose any type of coloring, suitable for short and long hairstyles. If the hair was lightened, staining can be performed using pastel shades. During a large number of colors used procedure. However, they should not be very different from each other. We can not allow the emergence of differences over, than one tone. Generally considered to be immutable. If a woman wants to achieve a smooth transition, produced a semi staining strands. Take a small amount of hair. To get a spectacular hairstyle, use contrasting colors. Usually applied to very light hair. They can be bright or muted. Often used black, vermilion, purple or pink. It is applied to the strands. The trend is considered to be a black and white hair coloring. Experts call it salt pepper. Staining using bold woman. During the procedure the master color the hair in cold ashen. In this case, the roots are dark black. Border spillover eroded. 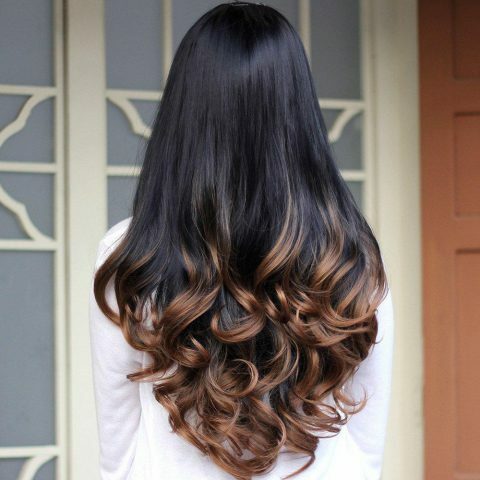 If you are coloring on brown hair, it is recommended to use a technique Ombre. Strands can lighten or darken. This creates a clear and contrasting border lines. Sometimes bright colors applied. Advantageous looks and technology balayazh. Coloring on dark hair will add to the brightness of the image. Radical change in appearance does not occur. Experts advise to prefer blondirovanie. In this part is lightened haircut. Performed a smooth transition of tones in a natural shade. ends of the hair are painted in a couple of colors. However, they differ on 1-2 t. If a woman wants to give the hairstyle a reddish tint, you can enlist the help of technology Ombre. During the procedure, performed lightening all strands. Suitable coloring and horizontal. This creates a clear boundary between the colors. If the stain has been widely strands, You can visually increase the volume of hair styles. Features staining depend on the length of hair and hairstyles. If it is big enough, during horizontal staining multiple colors will be used. They can be created straight or blurred boundaries. The result depends on the wishes of the woman. If you are coloring to black hair, the image will be included a note of non-standard. You can use different colors. This creates clear boundaries or neat transitions. If a woman wants to give volume curls, It uses multi-color staining. Expert will select the base color. Based on it will be picked up additional shades. They should not be too different from the pitch. The method is recommended to choose the winner of thin hair. As a result, it is able to give the hairstyle sheen and create beautiful iridescence. On dark hair coloring can be performed using different techniques. They range from Ombre and blondirovanija to trivalent and avant-garde staining. The choice depends on personal preference and fantasy woman. It is important to listen to the barber. He will give advice depending on the type of appearance. Pre encouraged to review photos. Red hair emphasize originality and originality girl. Hairstyle attracts the attention of others. Hair coloring allows you to make it more spectacular. Applicable partial staining method. ultra-saturated colors or more quiet colors can be used. Staining is performed on a few strands. Sometimes produced coloring bangs. Apply contrasting shades. If a woman has a long fringe, It may be lightening basal portion. At the same time the tips are painted in bright saturated colors. A field for experimentation is not limited. 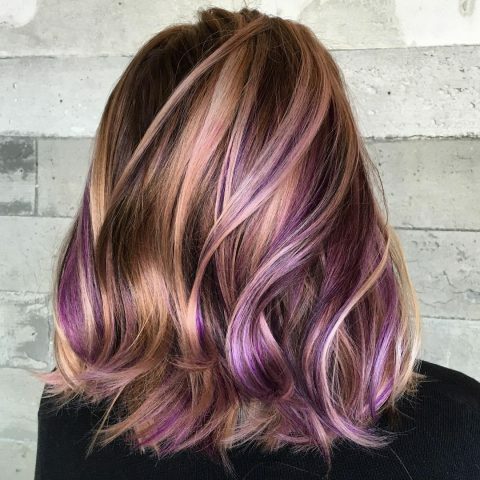 Hair coloring allows you to show imagination. After the procedure can be obtained and non-standard creative hairstyle. Technology continues to be at the peak of popularity. Use the method can be, turning to the salon. Self-fulfillment is also possible. However, the increased risk of damage to curls and an unexpected outcome. Hair coloring is best carried in the cabin. The process will be more complex, than classical painting. Therefore, the cost of services above. On average, the price varies from 2000 to 5000 rub.. The exact cost depends on the product technology and length of hair. If it is less 20 cm, have to pay 2.000-4.000 rub. Coloring on average costs about hair 5000-7.000 rub. If the hair is long, the price can reach up to 10000 rub.. ink cost in the price of the procedure is not included. It is paid separately. Prestige cabin and its location also affect the value of the index. The cost of the procedure made up the price of rent. In Moscow, the hair coloring will pay more, than the same procedure in other cities. You can save on coloring, referring to the masters, working at home. They do not pay for rent, thus reducing the price of the service. However, resorting to such specialists also increases the risks. Services may offer self-taught, not knowing basic characteristics of the selected technology. If a woman has decided to appeal to such a master, previously recommended to study the reviews and see the photos of the executed works. It is important to pay attention to the background. If it is constantly changing, it may talk about using other people's work. Preliminary preparation. starts 2-3 the day before the procedure. It involves cleansing curls. To do this, they are washed with a special shampoo. After the procedure is prohibited to use gels, varnishes, foams and other styling. Rule valid until staining. Test for allergic reaction. Before the procedure is carried out. To test the sensitivity of the skin to the components means the woman must apply a small amount of coloring compositions to the inner fold of the elbow. Then you need to wait a little longer. If the skin does not react to the execution procedure, coloring can be carried out. Protection clothing and leather. Shoulders recommended to throw an old towel. Paint can ruin clothes. A towel to protect it from getting funds. The skin is smeared with Vaseline, cream or other fat composition. Undergo treatment at the hairline on the forehead and temples. The action is taken to prevent occurrence of stains soak up paint. dye preparation. They are diluted prior to application. The procedure is performed in a plastic bowl. All formulations are prepared strictly according to instructions. It is attached to them. It is necessary to carry out thorough mixing. A woman should follow, to no more lumps. Each dye is prepared in a separate bowl. To avoid confusion, where what color, recommended capacity mark. individual brushes are used for each dye. If there is an additional device, After each use, the brush is rinsed and dried. Performing hair coloring. The process is carried out depending on the type and equipment. Typically, the total weight of the curls is separated into distinct zones. Staining is performed sequentially. Under a piece of foil applied strands. Work must be performed quickly. In that situation can turn out uneven coloring. If exposure begins with a bang, We need to move in the direction of the occiput. When coloring from the back of, the movement is made to the forehead. The final stage. Hair coated with the composition are wrapped in foil and fixed on the head. Hold means necessary amount of time, which is indicated in the instructions or on the packaging. paint Flushing is performed with water and shampoo. Then applied Balm. leather, located on the forehead, behind the ears and at the temples should be treated with cosmetic milk and tonic. Then she listens. For this purpose, hair dryer. However, experts recommend to the strands to dry naturally. The optimum length for coloring strands considered 5 mm. When the hair coloring is completed, we can estimate the finished result. Staining harms hair. Negative effects occur even after using sparing means. After each shampooing woman should use the balm-conditioner. It is necessary to give preference to the means with moisturizing effect. It will give the curls shine. Balm-conditioner is capable of restoring the water balance of the hair. Careful selection should be carried out in respect of shampoo. It is better to give preference to an agent for dyed hair. It is important to study the composition of the cosmetic product. It should contain natural ingredients. It needs to perform restorative mask. They are best to do at least once a week. Masks will be able to make your own or buy ready-made structure in the specialty store. Recipes will be able to find on the Internet. Homemade mask made from simple ingredients, sold in most stores. The selection means may be implemented depending on the desired result. It is necessary to give preference to the masks, containing vitamins A and E. Additionally performed firming mask. The process is recommended to do once a week. Positive reputation earned coconut and argan oil. The substance has a strengthening effect on the hair and nourishes them with food. Oil recommended daily. Remedy is applied to the tips of curls. it is recommended to carry out the procedure for 30-40 minutes before sleep. Using a hair dryer and ironing for straightening is recommended to minimize. High temperatures increase the fragility of hair and weakens their. Refuse recommended by perm and. If a woman wants to keep longer the result achieved, It recommended not to use the pool, wherein the chlorinated water is present, as well as to minimize the amount of time, carried out in the open sun.